For centuries the Pennines presented a barrier to cross country trade in the north. Eventually the growth of the cotton and textile industries led to the construction of a canal between Liverpool and Leeds. It was built as a broad canal which permitted wide beamed boats, capable of carrying greater loads, enabling it to be a success. Today the Leeds and Liverpool Canal is a popular cruising route and although a lengthy canal to navigate or explore all in one visit, the settlements, canal features and ever changing landscapes along its route make it worthy of return visits by boat, car, bicycle or on foot. As with many of the canals on the system it is a canal of real contrasts, in places it is quiet and tranquil, in others vibrant and bustling. The once shabby nearly unnavigable Liverpool end has been revitalised now that the Liverpool Canal Link is open, creating a passageway through an important historic city and port, whilst at the opposite end the waterfront area of Leeds is undergoing an exciting transformation. A tourist map of the Leeds and Liverpool Canal, from Liverpool to Keighley at 1:50,000, with detailed town plans of Blackburn, Burnley, Skipton and Wigan at 1:12,500. 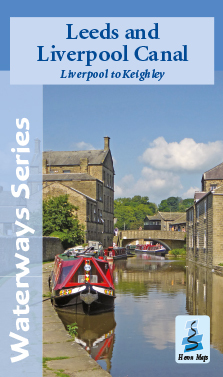 The Leeds and Liverpool Canal map, from Liverpool to Keighley, is available to buy online or by telephone from our business partner, Guidepost. Click on the logo below to visit their store.